The crew sails Oakcliff's Class 40 to the States. Over and over those words played through Hobie Ponting’s head as he boarded a plane to England. He and his team had set off to Hamble, England, to take delivery of a Class 40 sailboat that had been donated to Oakcliff Sailing. The plan was to return to the States via the inaugural Royal Ocean Racing Club Transatlantic Race, departing from the Canary Islands and finishing in Grenada. None of them had ever sailed a Class 40. None of the crew had ever crossed an ocean. None of them knew what awaited them other than 7,000 miles of ocean sailing. Twenty-two year old Hobie Ponting was a confident, ambitious optimist coming out of college with one semester of racing experience and lots of sailing on his family’s Catalina. As a senior at the University of Wisconsin-Milwaukee, he faced the daunting task of deciding how to spend the rest of his life. With a bachelor’s degree in political science and an interest in the law, he did what any sensible college grad would do: He set aside everything and dared to pursue his dreams. The day after graduation he drove out to Oyster Bay, New York, to begin a summer-long apprenticeship with Oakcliff Sailing. Oakcliff is a nonprofit coaching and training center dedicated to building the next generation of American leaders through sailing. The center hosts a number of trainees each year in its Sapling program. This fully immersive apprenticeship throws trainees headfirst into the world of sailing, covering everything from sailmaking to offshore navigation. Oakcliff is the only all-inclusive training center of its kind, and probably the only place in the world capable of turning the 22-year-old nipper into a 25-year old transatlantic veteran. 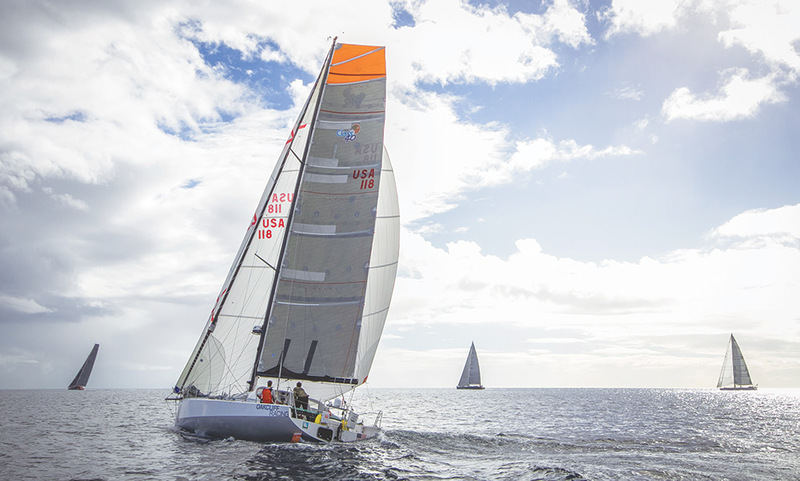 Hobie Ponting sails for the States. “I remember Jeff, one of our coaches, saying to me, ‘When you think that you’ve lost a tooth because of the slamming, you know it’s a bad one. When you’ve hit the bottom of the wave so hard that you’re certain that the rig has come down, you know it’s a bad one.’” As it would turn out, the conditions they experienced on the way to Guernsey were just a taste of what was to come. The journey began more than a year before when Dan Flannigan, a friend of Ponting’s, phoned Dawn Riley, executive director of Oakcliff Sailing, with the idea of entering a youth team into a transatlantic race. “If we can’t find a ride, we’ll make our own,” they said. Then it came together. 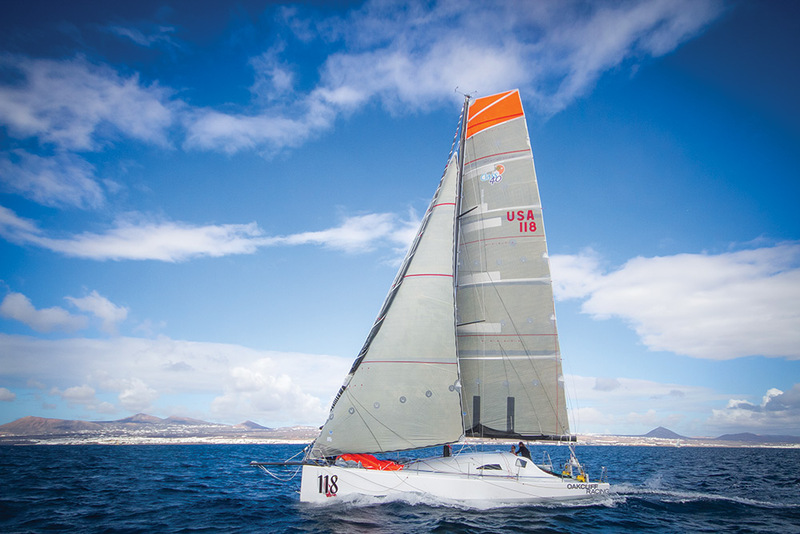 Bodacious Dream LLC donated the Class 40 sailed around the world by Dave Rearick. With a boat in hand, the biggest hurdle the Oakcliff group faced, as so many young sailors do, was lack of experience. “We’d never been out there for 14 days in a row and we’d never been seven days from help,” Ponting said. The initial idea was for Flannigan and Ponting to do a doublehanded delivery back from England. “How oblivious were we,” said Ponting, thinking back on the idea, grinning ear-to-ear. The odyssey that began as a dream, developed into an idea. Eventually, with heavy modifications and nearly a year of planning, the idea finally became a reality. Chris Kennedy takes in an ocean rainbow. With guidance from Oakcliff coaches and industry experts, the plan matured into a fully crewed 7,000-mile journey with stops in Guernsey, the Canary Islands, Grenada, and ending in Charleston, South Carolina. Flannigan and Ponting would be joined by Chris Kennedy and Andrew “OD” O’Donnell, both keen young sailors also working at Oakcliff. The four of them arrived in England in early November with less than a month to master the boat and sail it 1,700 miles south to the start of the RORC Transatlantic race. Meanwhile back at Oakcliff, Riley faced countless questions on the wisdom of sending “kids” across an ocean. The team was by no means unprepared. Flannigan, a naval architect, had perhaps the least sailing experience but was the most knowledgeable of the four. Ponting had a keen eye for electronics and quickly took to navigation. “I knew he would be a bit nervous and feel the weight of responsibility more than anyone else,” Riley said. Kennedy, an aerospace engineer by trade, is the type of person who never stops asking questions and can fix just about anything on a boat. And O’Donnell is a beast on deck. That’s not to say the learning curve wasn’t steep. It included a spinnaker overboard, damage to the radar mount and an extended pit stop in Madeira. But by the grace of Poseidon, they and the boat arrived safely in Lanzarote, an island in the Canaries, the day before the start. The crew sets off on the RORC Transatlantic Race. Immediately the call rang out for all hands on deck. The shackle on the A4 spinnaker halyard failed and the massive kite was submerged underwater. “We were really nervous because we knew the forecast called for that sail, nearly the whole way across.” Flannigan took the helm as OD, Ponting and Kennedy jumped to the bow. As the three of them hauled in the sail, Flannigan worked to keep the boat from slicing it in two and effectively ending any possibility of a podium finish. It took nearly 30 minutes to haul it back on deck but moments later Chris had whipped up a soft shackle and the unharmed chute was back up the mast. Night after night, heavy winds and frequent squalls pummeled the fleet as it battled its way west. 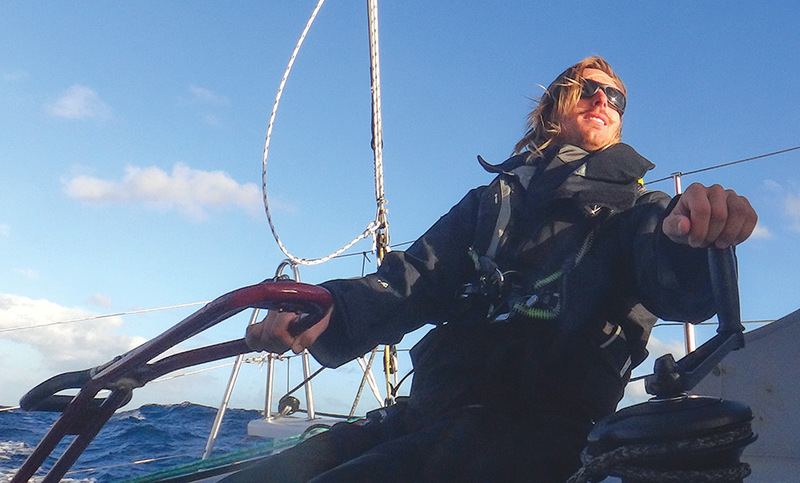 For Ponting, the biggest challenge was not the physical exertion, the heavy seas or the limited sleep, but instead the constant anxiety that they were either pushing too hard or not pushing hard enough. 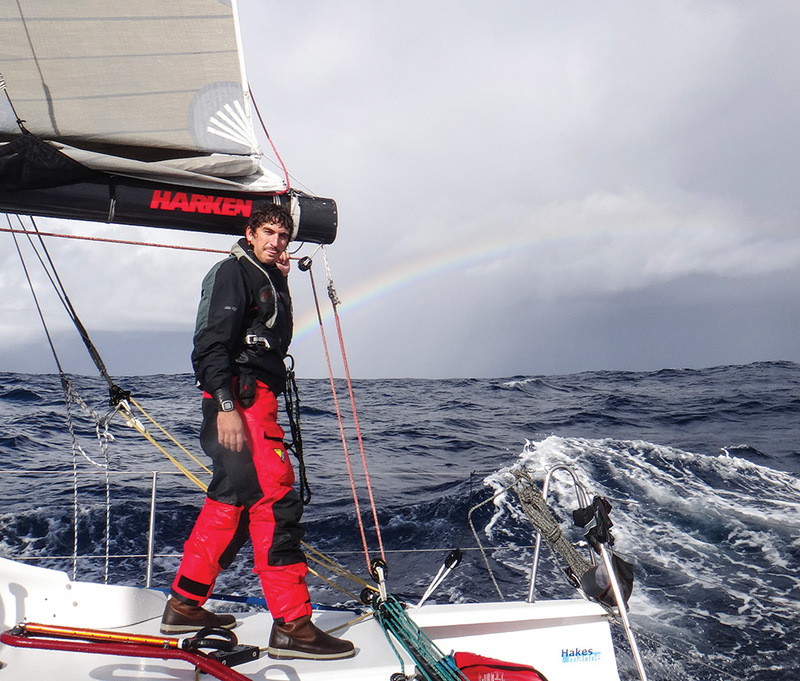 “Was the right move to go to a smaller sail, or was the right move to use this weather to sail the boat at 25 knots? We were trying to toe a fine line between equipment preservation and racing,” he said. Twelve days after departing, Bodacious Dream pulled into Grenada at 9:15 p.m. They finished first in their fleet, nearly 40 hours before the next Class 40, and second overall, only 13 hours (corrected) behind the overall winner, a custom 78-foot luxury ocean racer. 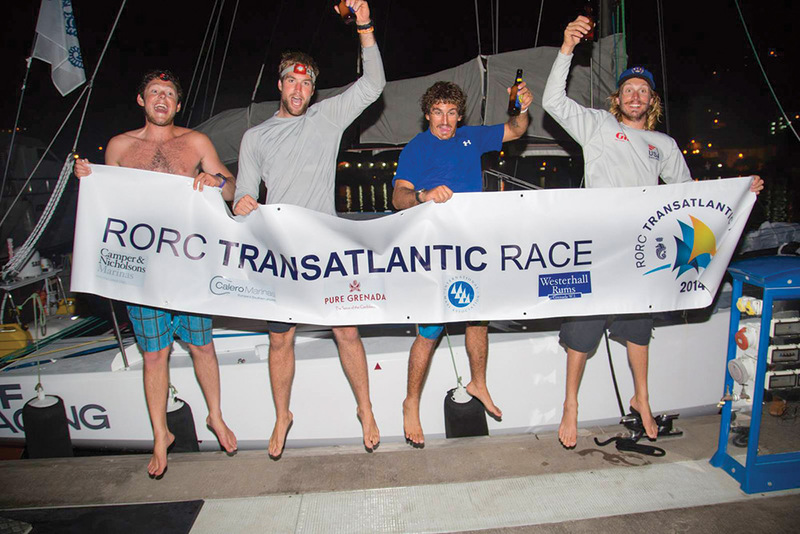 The crew celebrates their Transatlantic Race finish. On the dock in Grenada, a huge welcoming party awaited. “There were all these reporters, camera flashes, people cheering, people waving American flags. The mayor was there, the marina president was there. It was incredible.” Ponting remembers telling reporters he wanted two things: a fresh meal and a clean bed. Soon after, he found himself scarfing down three plates of jerk chicken and two banana daiquiris. He woke up on the front porch of their hotel. Two days later they were back on the boat setting off for another 1,100-mile delivery to Charleston. They pulled into the harbor at 5 a.m. on December 24. The next morning he was a thousand miles away, celebrating Christmas with his family in Wisconsin. Since that time a year ago, Ponting has been managing the Class 40 for Oakcliff full time. He has overseen a yearlong campaign that included the Ocean Race North, Annapolis Newport Race and the Marblehead to Halifax race. Recently, he led the boat through a full refit and is now actively looking for sponsors to train the next generation of offshore sailors. He is hoping to compete in several events including the Miami to Havana race, the Caribbean 600 and the 2016 Atlantic Cup. Nearly four years from his first day at Oakcliff, postgrad Hobie Ponting is hardly recognizable. He has been replaced by a hardened sailor with more than 10,000 miles and a transatlantic race under his belt. But his appetite is far from satisfied, and when asked if he would do the race again, his answer is pretty clear. Ponting’s latest dream is the Quebec to St. Malo race. Another 3,100-mile transatlantic and another chance to face those demons.